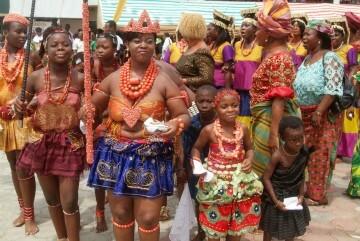 The fattening room is an ancient practice in calabar which gradually going extinct . The fattening room is a place young women are prepared for womanhood. In ancient times, fat was viewed as a sign of prosperity, fertility and beauty. Young girls are usually taken to the fattening room during puberty. Acceptance into the fattening room was viewed as a privilege as it was a demonstration of virtue, sexual purity and Proved virginity. The ability of the young girl to gain weight in the fattening room was a sign that she possessed all the above mentioned qualities. A young girl due to enter the fattening room is usually mandated by her father to do so as the girls chastity is viewed as her father’s responsibility. The father of the girl also invest by paying what is called ”Eme” (coral beads) to appease ”Nku” (the river goddess of the house) before she is accepted into the fattening room.The concept is to show that the parents of the girl are wealthy enough to give their daughter a good life. Once in the Fattening room the girls are kept away from their family members and friends, the only visitors allowed are the elderly women in the community who come to pass on lessons on marital etiquette and acceptable social customs and behavior. The girls are also handfed Heavy meals rich in carbohydrate and fat, Sometimes the girls do not find this process pleasant as they have to consume the food regardless of their appetite. They are also given all-round beauty treatment from head to feet, using what is called ndom (native chalk) and other massage oils made from natural plants. 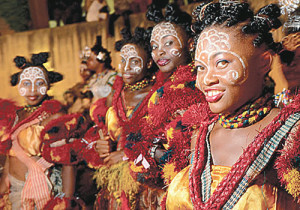 The training and beauty therapy is carried out over a period of one month or more while the girls are each housed in seclusion away from the public as they undergo preparation for marriage and womanhood.Before the end of their stay in the fattening room the girls are circumcised by their mothers this is to ensure she has limited sexual activity and remains chaste till marriage, it also helps her remain faithful in her marriage. At the end of the Nkugho the girl is ceremoniously revealed to the community to show how big and beautiful she is now , well wishers and potential suitors are also invited to watch her dance.The Ibibio people of Akwa Ibom State also practice the fattening room tradition. The tradition is somewhat similar to that of the Efiks, but the Ibibios call the fattening room ”Mbopo”.